Nikon, the leading company of manufacturing imaging products like cameras, optics etc. comes to you with an exciting offer to bless your best moments with Nikon cameras. Camera plays a big role in capturing your life’s happy moments and makes them memorable for lifetime. When your kids make any alluring activity, you will always wish to capture those moments and activities in still images or in video. Then, Nikon is here with you for fulfilling all your wishes to capture moments with its best and quality cameras. The famous camera manufacturer is bringing a new offer for you which present one extra lens of your choice on the purchase of any Nikon camera. 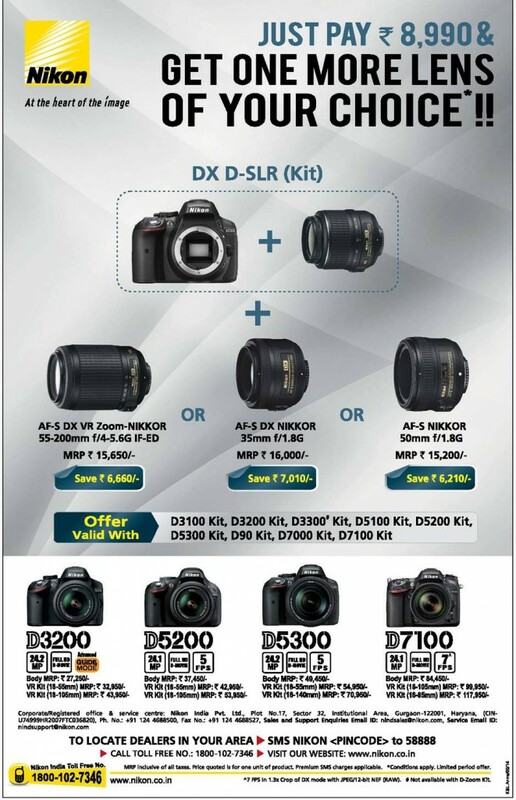 The offering is valid for purchasing its DX D-SLR kit, then it will give you the choice of selecting one more lens of any price as per your choice among three lenses (AF-S DX VR Zoom-NIKKOR 55-200mm f/4-5.6G IF-ED, AF-S DX NIKKOR 35mm f/1.8G and AF-S NIKKOR 50mm f/1.8G). You just need to pay 8,990 INR only for any lens.